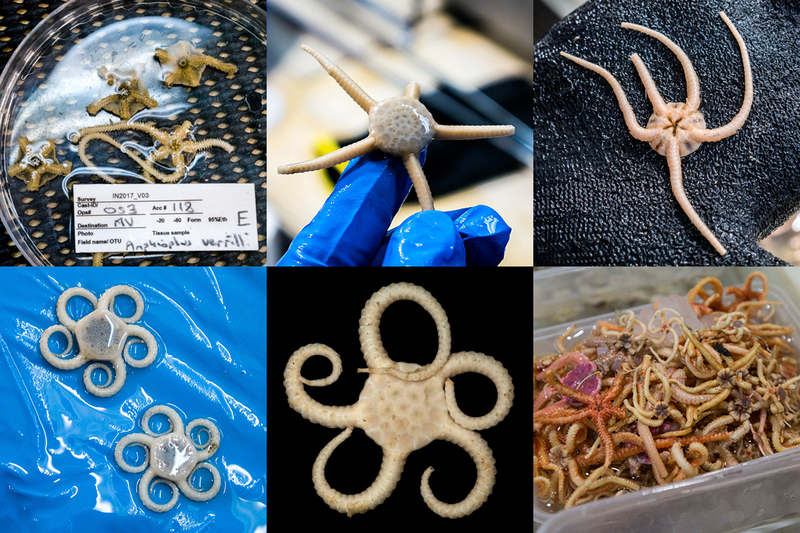 Why would you love a brittle-star? They have no eyes and no brain (just a ring of nerves). 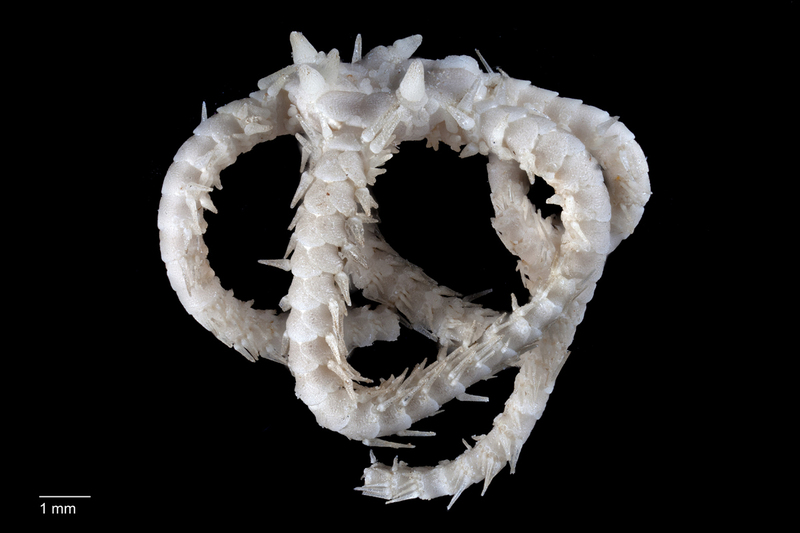 They almost always have a round central disc (with mouth, stomach and gonads), five radiating arms, some small spines on either side of the arms and maybe a few on the disc. 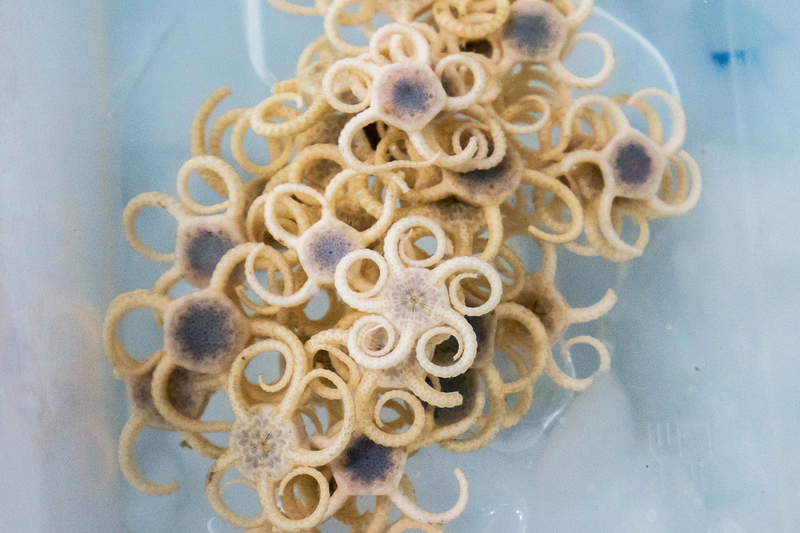 They are known as 'brittle-stars' because early collectors found that they broke in pieces easily when dried. Not much going on really. However, as a group they are amazingly successful. They have been around for more than 480 million years. All modern species date from a survivor of the great end-Permian extinction event of 252 million years ago, when most sea-life was obliterated. 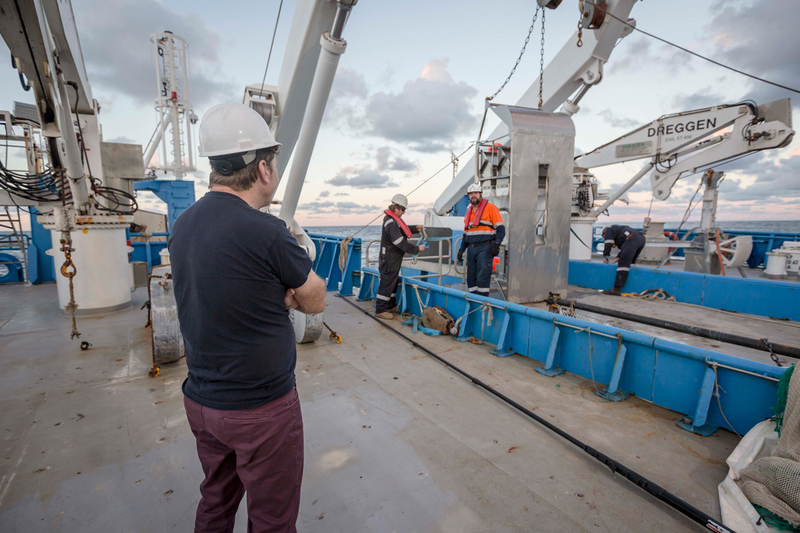 But now they cover almost every seafloor habitat, from the coast to the bottom of the deepest trenches, from the equator to the poles, and including rocky and muddy terrain. Now there are 2200 described species. But we are discovering with DNA that lots of these 'species' are actually groups of very similar animals, so it is likely that the final number will be more than 10 000 species. They mostly eat organic debris on the seafloor or hold up mucus covered arms to collect small animals in the water. Some are active carnivores and will pull down unfortunate shrimp or even small squid if they stray too near (see The Echinoblog). It is quite amazing to see them feeding in an aquarium. When not feeding, many species live hidden under rocks, only the tips of the arms emerging. These arm tips are covered in chemical and light sensors. Once food (such as tiny brine shrimps) is dropped into the aquarium, you see the arm tips rapidly stiffen in response. Slowly the animal emerges, sensing for danger. Then suddenly it becomes a free for all, the brittle-stars scurry over to the food, arms waving, rowing and pulling, until it is consumed. Apart from eating, the brittle-stars main concern is not being eaten. So in shallow sun-drenched waters often they have colourful patterns as a camouflage. Some can even change colour between night and day by expanding or contracting pigment cells in the skin. In deeper water they become orange or red, colours which appear black in low light marine waters. Others are a grey colour to match the seafloor mud. To further avoid being eaten, brittle-stars can emit a green or blue flashing light (see the blog post 'Beam us up Jérôme'). Some species will drop off a flashing arm when attacked: the fish grabs the arm and the rest of the animal escapes. Other species appear to use light to advertise their disgusting taste. Fish and crabs rapidly learn not to eat a flashing object! Brittle-stars are related to the more familiar starfish, spiny sea urchins, sea cucumbers and feather stars, and all of these groups possess special organs called tube feet. On brittle stars, these tube feet are under the arm and are used like sticky fingers, catching small prey, burrowing into mud, or helping the animal move over rock. They are like long water-filled balloons that can be controlled by sucking in or pushing water in and out of the tube. 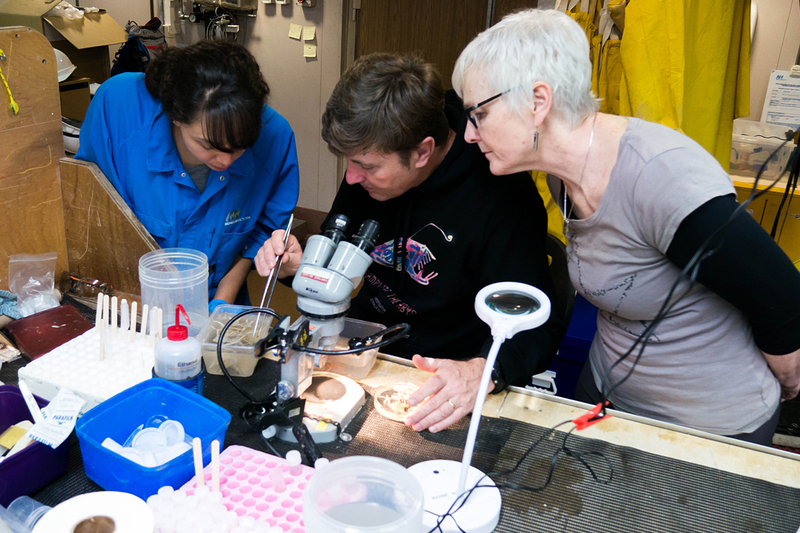 On this voyage we are discovering brittle-star paradise. 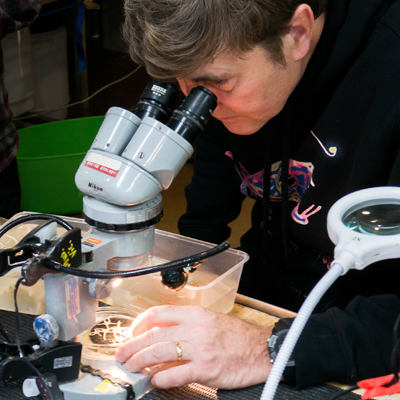 There are lots of species down there in the abyss. From large white species that scoot across the mud, spiny orange ones that climb corals and sponges to get higher in the water for a better feed, to soft red ones that scavenge dead flesh. We pulled up a massive dead manta ray the other day from a seafloor 1000 metres below. It was over four metres across, and it was a stinking mess of cartilage, skin and flesh. 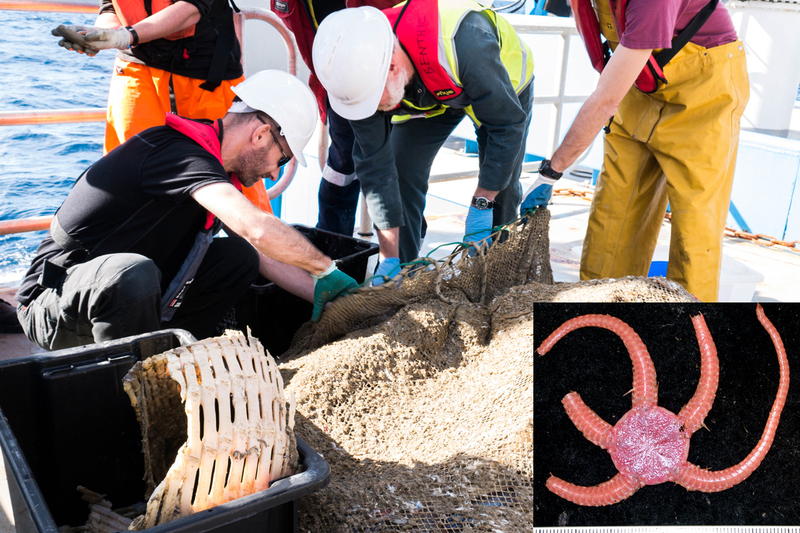 It was covered in large sea hoppers (technically amphipods) and masses of bright red brittle-stars. So to answer my original question. I like brittle-stars. I have liked them ever since my year 10 biology teacher pointed them out to me. 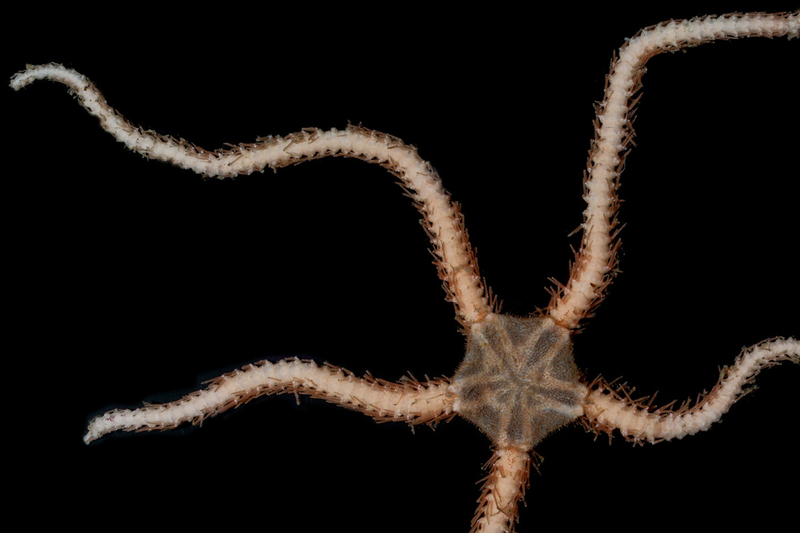 I haven’t always researched brittle-stars, but I keep on coming back to them. Since they are everywhere across the seafloor, they are great to map (see my previous blog post). For me they are a fine example of marine evolution. If we can understand how and where these guys evolved, maybe we can begin to grasp how life has originated and flourished on our blue planet. 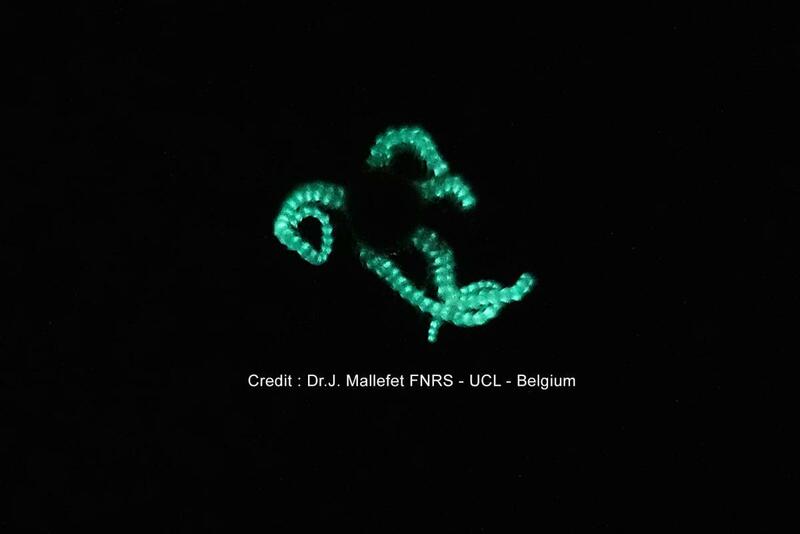 A fluorescing brittle-star, one of many bioluminescent deep-sea animals photographed on the RV Investigator voyage by Belgian scientist Jerome Mallefet. Sure, I haven't forgotten that brittle-stars can detect light, that was nice work. But I still think they you cant really call them eyes in the classic sense. More biochemical than alluring. They are sort of faceless, just like the fish! I have a very large green brittle star (bigger than my hand) and I have a medium brown brittle star. You can read all over the Internet how green stars are killers and eat fish. That's not true at all. My brittles eat frozen brine shrimp that falls to the bottom that the sea horses miss and they have an ABUNDANCE of amphipods. Both stars live in a 55 gallon tank with 5 seahorses snails hermit crabs and various types of shrimp. You barely TO rarely see the starfish but they are in the hiding under rocks and alive and well. The have all been tank mates for 6 months with no issues. They are great cleaners and cool to watch when you get to see them. Hi Bill. I haven't seen brittle stars eat fish either, certainly not live ones. Although there is great youtube video of a brittle star catching a small squid, captured on an Okeanos Explorer RoV. Google "brittle star eats squid" and you will see what I mean. The big green brittle-star you have is probably Ophiarachna incrassata, from Indonesia/Philippines.